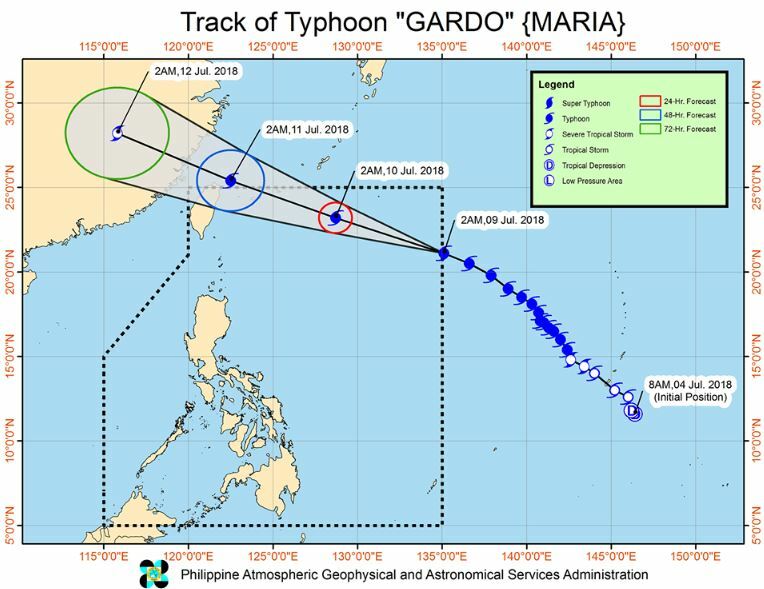 MANILA, Philippines – The typhoon with international name "Maria" has entered the Philippine Area of Responsibility (PAR) and was named Gardo, state weather bureau PAGASA announced in its 5:00 a.m. update on Monday, July 9, 2018. Typhoon Maria satellite image courtesy of DOST-PAGASA. At 4:00 a.m. today, the eye of Typhoon Gardo was located based on all available data at 1,325 km East of Basco, Batanes (21.3 °N, 134.7 °E). 'Bagyong Gardo' has maximum sustained winds of 200 kph near the center and gustiness of up to 245 kph. It is forecast to move West Northwest at 30 km/h. NOTE: NO TROPICAL CYCLONE WARNING SIGNAL raised as of press time. "GARDO" may enhance the Southwest Monsoon (Habagat) which will bring monsoon rains over MIMAROPA and Western Visayas, and occasional rains over Metro Manila, CALABARZON, Bicol Region, Zambales, Bataan, and Aurora until Tuesday (10 June). Meanwhile, monsoon rains may affect most of Luzon, especially over the western section, beginning Wednesday (11 June). Residents of these areas, especially those living in low-lying and mountainous areas, are advised to take appropriate actions against possible flooding and landslides resulting from heavy rains. Sea travel is risky over the northern and eastern seaboards of Northern Luzon. PAGASA said Typhoon Maria is possible to reach the super typhoon category. The "super typhoon" category was adopted following the country's experience with strong typhoons including "Yolanda" in 2013. It is equivalent to a category 5 storm, refers to tropical cyclones with maximum sustained winds of 220 kilometers per hour near the center, capable of causing massive destruction to life and property. Accuweather reported that 'super typhoon' Maria is expected to threaten lives and property when it barrels across Japan’s Ryukyu Islands, Taiwan and eastern China on Tuesday through Thursday.